The NATION has been reliably informed that the regional cement powerhouse has officially written the country’s final appellate court to have it determine that Rock Hard Cement should pay more than a five per cent tax, which was suggested last month by CARICOM’s Council of Trade and Economic Development (COTED). Two weeks ago, TCL’s public relations manager Michelle Langton said the company would make its next move only after the CCJ had ruled on COTED’s classification between June 11 and 12. That was after COTED had last month classified Rock Hard’s product imported from Portugal as “other hydraulic cement”, which would make it eligible for only a five per cent tariff. 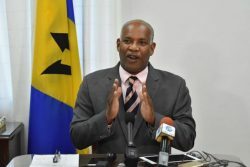 TCL had been arguing in a substantive case to the CCJ that the product should attract a 60 per cent tax since it was imported from outside CARICOM and was in fact “building cement grey”. Rock Hard’s managing director Mark Maloney, who two weeks ago indicated he fully expected TCL to raise the stakes, said he was not shocked at this latest development.